Dealing with hyperhidrosis can be tough. 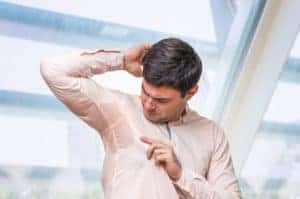 If you’re one of the 8 million Americans who sweat four to five times more than the average person, you need to figure out a way to control excessive sweating and fight back against hyperhidrosis. How to treat hyperhidrosis is the tricky part. There comes a point when you have to ask yourself how to choose the right treatments for hyperhidrosis. 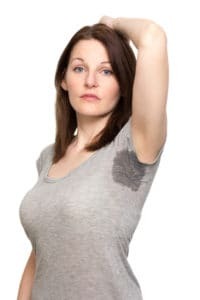 Here are a few things to consider that will help you ad you figure out how to choose the right treatments for hyperhidrosis and reduce excessive sweating in your daily life. Realizing that you aren’t going to cure all your issues after a day or two is important. If you go into any treatment with such high expectations, you will likely be disappointed and even more stressed than before. You have to remember that there is no magical cure when battling hyperhidrosis. While certain treatments might provide immediate results, beware that your issues could come back with a vengeance if you aren’t careful. So do your best to set realistic expectations and remain positive. You have to consult with a medical professional about any complications you might have before you begin various treatments. Make sure you do some research online and look up what kinds of treatments might work best for you, but tell your doctor everything so they can give you medical advice. Hopefully, you’ll be cleared to give certain treatments a try, but be sure to find out before you take any medications. Iontophoresis therapy typically lasts between 10 and 20 minutes and can be very effective. Iontophoresis is a common technique used to combat hyperhidrosis (especially on the hands and feet). The process involves introducing ionic medicinal compounds to the skin by applying an electric current. Keep in mind that even if this treatment is your best option, it won’t work right away. Severe hyperhidrosis sufferers might need two to three treatments per week to control excessive sweating. Noting your progress, or lack thereof, is essential as you fight your hyperhidrosis. If you aren’t keeping track of what is and isn’t working, you aren’t going to have much success in the future if you have to continue these treatments. So monitor your progress at every step of the way and continue to speak with your doctor about what’s going on. If you’re still unsure of how to choose the right treatments for hyperhidrosis or want to speak with professionals with experience in combating excessive sweating, contact Hidrex USA today. Hyperhidrosis is among the primary causes of excessive sweating problems. While this might seem like a minor annoyance, it can have a large impact, especially on quality of life. In fact, of hyperhidrosis sufferers, 90% say that it has a large effect on their emotional well-being and their confidence. Fortunately, there exist tools to help combat this issue. Iontophoresis is a system in which electricity is used to stop hyperhidrosis. Invented over 50 years ago, this amazing tool has been instrumental in the lives of many. Still, for those just recently diagnosed, it can seem alien. In order to better facilitate your use of an iontophoresis, we’ve compiled four handy tips that will keep your treatment on track. Set Expectations: One of the most important things to remember is that there is no magical cure. While iontophoresis is remarkably effective, it also takes time before it can work fully. In fact. It can take up to 10 treatments before you begin to see a result. So don’t sweat it if you end up waiting for your treatment to take effect. Stick to Your Plan: It might seem silly to state, but you’d be surprised how often people give up on their iontophoresis treatments, or how unattentive they are to their set schedule. Regularity of your treatment is an incredibly important factor in determining its success, so make sure you undergo treatment at the right time and the right duration. Troubleshoot: If you aren’t seeing the results you want after a certain amount of time, then you should try mixing up your routine — in a controlled way. Experiment with the electrical current you are using or the length of your session to see if it is possible to obtain better results while making only minor adjustments. Keep a Dairy: Maintaining a diary not just of your treatment information but also about its effectiveness is a helpful way to optimize your iontophoresis treatments. It will help you better spot trends of improvements over the long run. Iontophoresis machines are a powerful tool for someone trying to understand how to stop hyperhidrosis. But the machine alone may not be enough to help reduce excessive sweating. By following the tips above, you can better empower yourself to beat chronic sweating and regain your confidence and quality of life. Sweating is a normal bodily function, but it can be a source of extreme embarrassment if it is not controlled properly. No matter why you are sweating, whether it is because of the heat or stress, you may need to take additional measures to ensure sweating doesn’t take over your life. This is especially true for those who suffer from hyperhidrosis, which is a medical condition that is a cause of excessive sweating. If you suffer from this, don’t fret as there are plenty of tips to stop excessive sweating in its tracks. Here are some easy ideas to follow that will help you cope with heavy sweating in your everyday life. Use antiperspirant — but at night. Many people turn to antiperspirant to help combat their sweating, but they don’t apply it at the right time. Most antiperspirants work the best at night time as the active ingredients have to go down deep into the sweat duct to clog it. Applying at night gives this time to soak in, when applying in the morning adds to the risk of it washing off. Dressing strategically can mean the difference between damp clothes and clothes that feel comfortable throughout the day. We recommend that you choose clothes with fabrics that are airy and breathable; the lighter the clothes, the more loosely woven the threads will be and the cooler you’ll feel. When it gets colder out, try to dress in layers so you’ll feel comfortable. An iontophoresis treatment is a common technique used to combat sweating, especially on the hands and feet. It introduces ionic medicinal compounds to the skin by applying a local electric current and can be prescribed by a doctor for those who suffer from extreme cases of hyperhidrosis. However, know that this treatment won’t work immediately, as severe hyperhidrosis sufferers may need two to three iontophoresis treatments per week to see adequate results. Remember, it is crucial that you figure out the reasons behind your sweating to adequately treat it. Simply following these tips to stop excessive sweating will help you live a comfortable life, so try out different methods today to find what works best for you.